Home/FATCA, FBAR, foreign taxes, Resources, US taxes/Are you a US citizen with a foreign bank account? Update: For tax year 2013, Form TDF 90-22.1 has been replaced with by the new Form FinCEN 114 and is required to be filed electronically. The aggregate value of all foreign financial accounts exceeded $10,000 USD at any time during the calendar year to be reported. 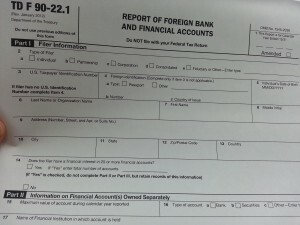 The FBAR is a tool to help the US government identify persons who may be using foreign financial accounts to circumvent US law. Investigators use FBARs to help identify or trace funds used for illicit purposes or to identify unreported income maintained or generated abroad. Severe civil and criminal penalties may be imposed for noncompliance of FBAR filing. In 2011, the IRS also implemented a new reporting requirement for US taxpayers with foreign financial assets greater than certain thresholds beginning at $50,000 USD. This is Form 8938 Statement of Specified Foreign Financial Assets is also required in addition to the FBAR. Beginning on January 1, 2014, foreign banks and financial institutions will be required to report certain information to the US government about US source income and US account holders. FATCA (Foreign Account Tax Compliance Act) was enacted in 2010 and gradually has required more reporting in stages for individuals and foreign banks and financial institutions. If you are located in Hong Kong, please contact us today if you have additional questions or would like to schedule a consultation.